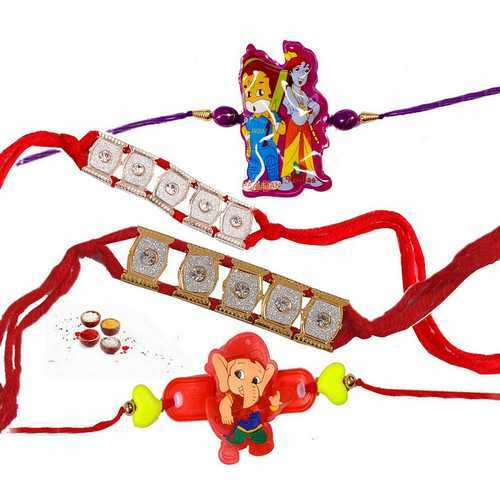 Raksha Bandhan is one of the major festivals in India which celebrates the eternal relationship between a brother and sister. 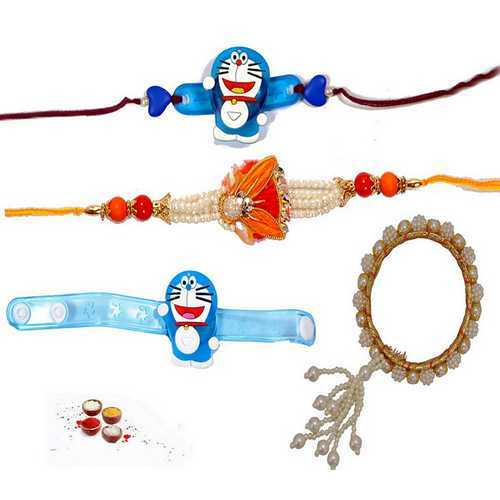 The spirit of Rakhi lies in a strong sense of bonding which is not only restricted between brothers and sisters but goes far beyond. 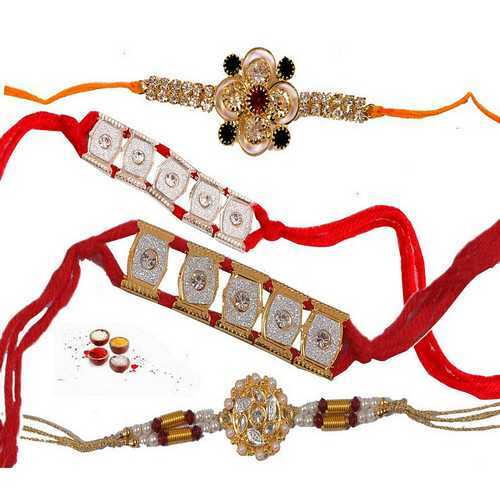 A Rakhi thread can be tied on the hand of persons across different religions, race and creed to show solidarity and love. The luckiest women are those who have more than one doting brothers. You feel protected and safe, wherever you are in the world. It gives you a permanent sense of security and sustainability. 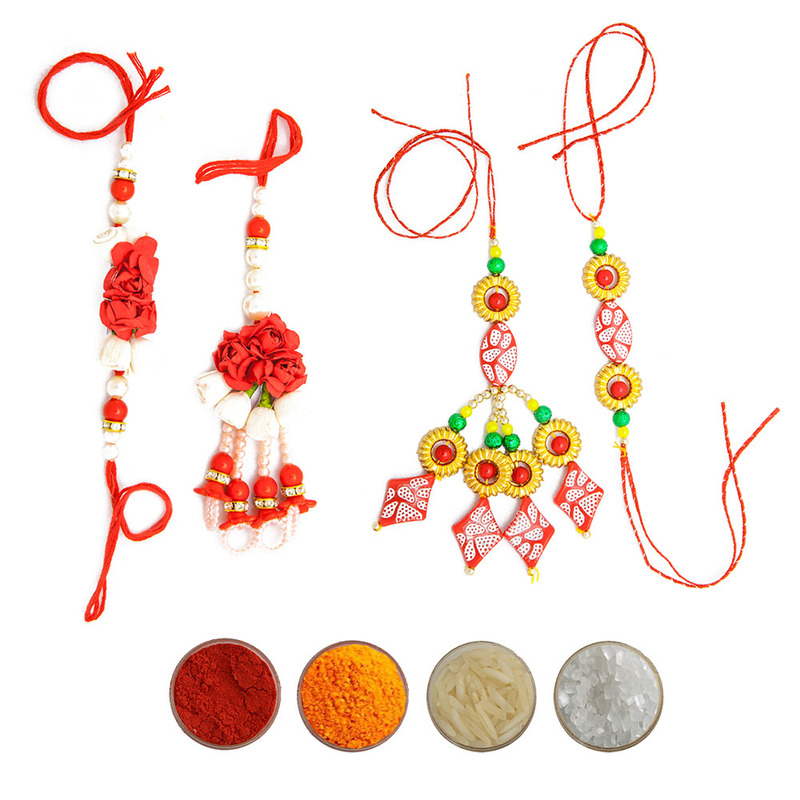 Share that joy with your brothers by sending them a gorgeous Set of 4 Rakhis for each of your four brothers. 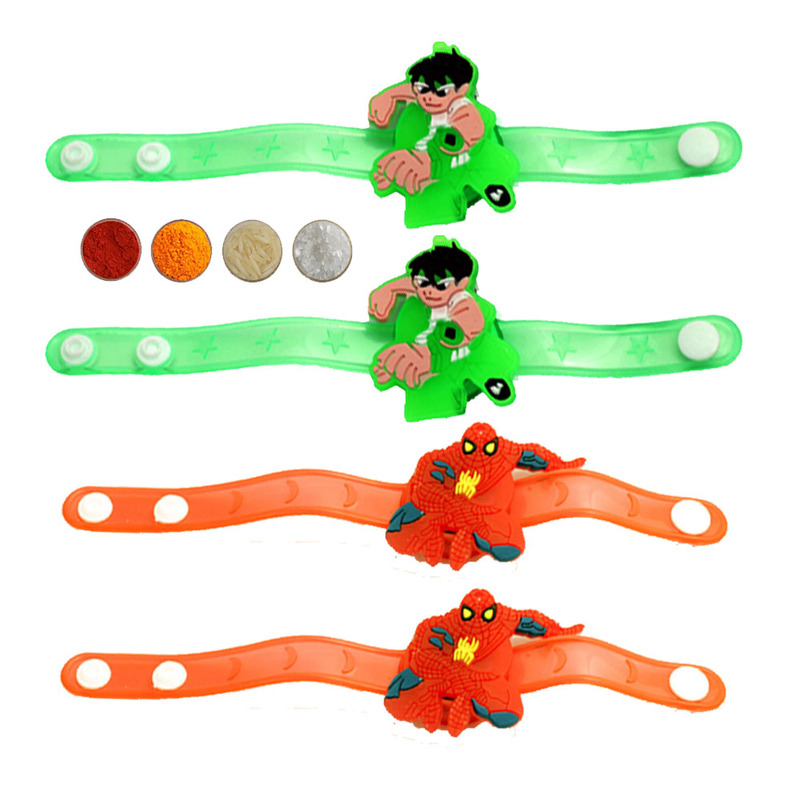 Set of 4 rakhi with us comprises of Bhaiya rakhi, 2 Bhaiya and 2 Bhabhi rakhi, 1 Bhaiya 1 Bhabhi and 2 kids rakhi, 4 Bhaiya rakhi, 4 kids rakhi and 4 Lumba rakhi for Bhabhi. 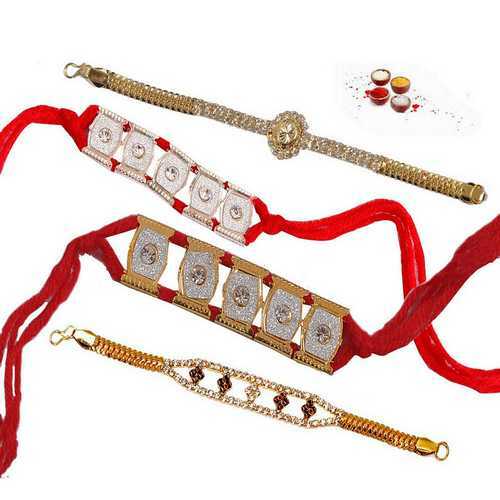 For the sisters who have lot of brothers, Elite Handicrafts presents the mesmerizing combo of set of four rakhis. 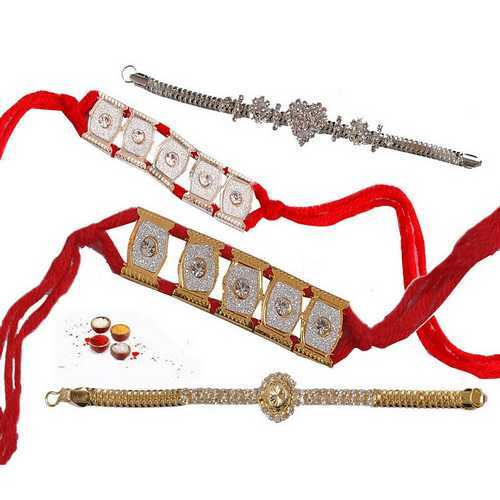 We have very amazing range of set of 4 rakhis that comprises of attractive rakhi designs such as beads rakhi, pearl rakhi, diamond rakhi, designer rakhi, silver rakhi, golden rakhi, Zari rakhi, Zardosi rakhi, Chandan rakhi, Kundan rakhi, Navratna rakhi, premium stone rakhi, diamond rakhi, studded rakhi and jeweled rakhi. 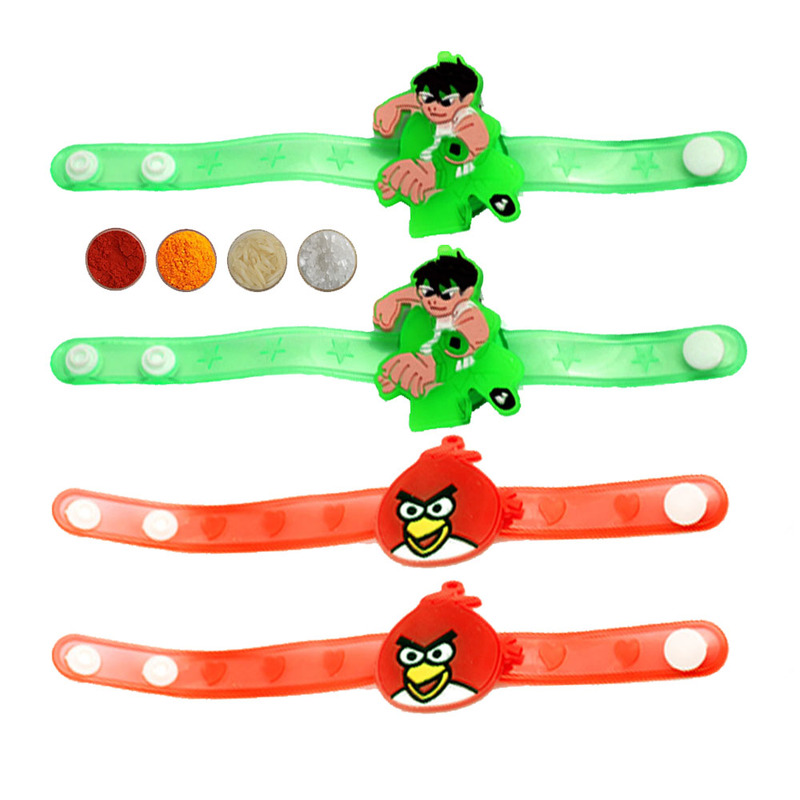 Even the rakhis meant for the kids have undergone huge changes from being traditional to trendy. 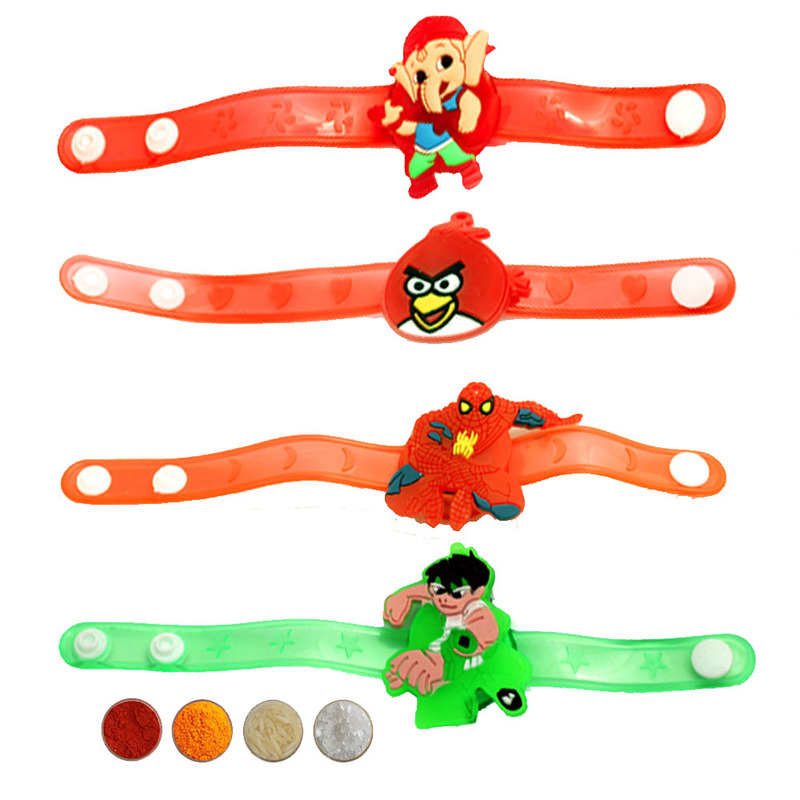 As children are fascinated by cartoons, these rakhis have cartoon characters on them. 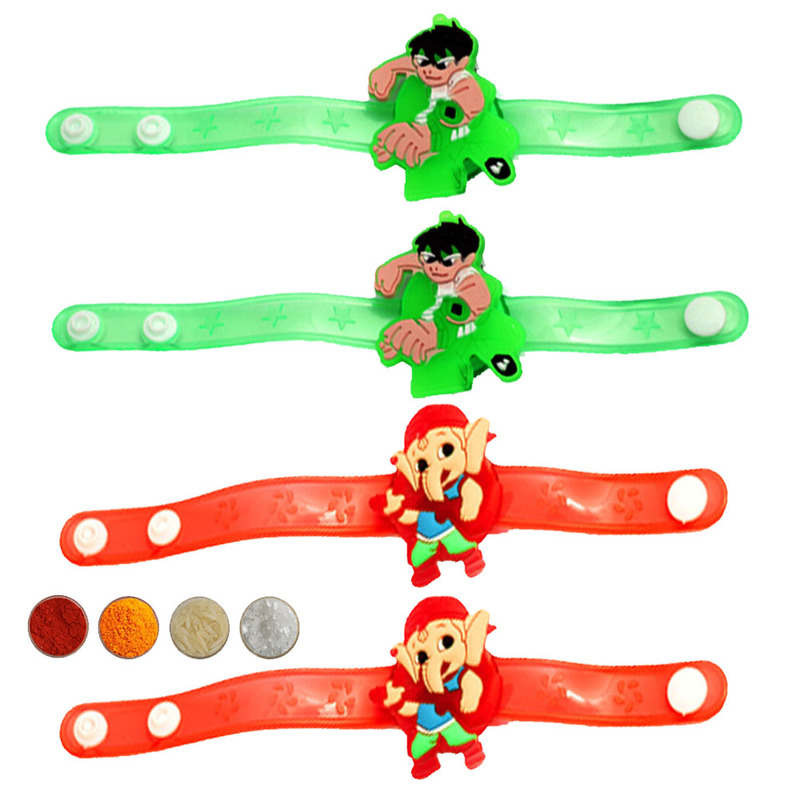 These rakhis are having the miniature of kid’s favorite cartoon characters like Mickey Mouse and Donald Duck to Chota Bheem, BAL Ganesh, Hanuman, Angry Birds or spiderman on them. 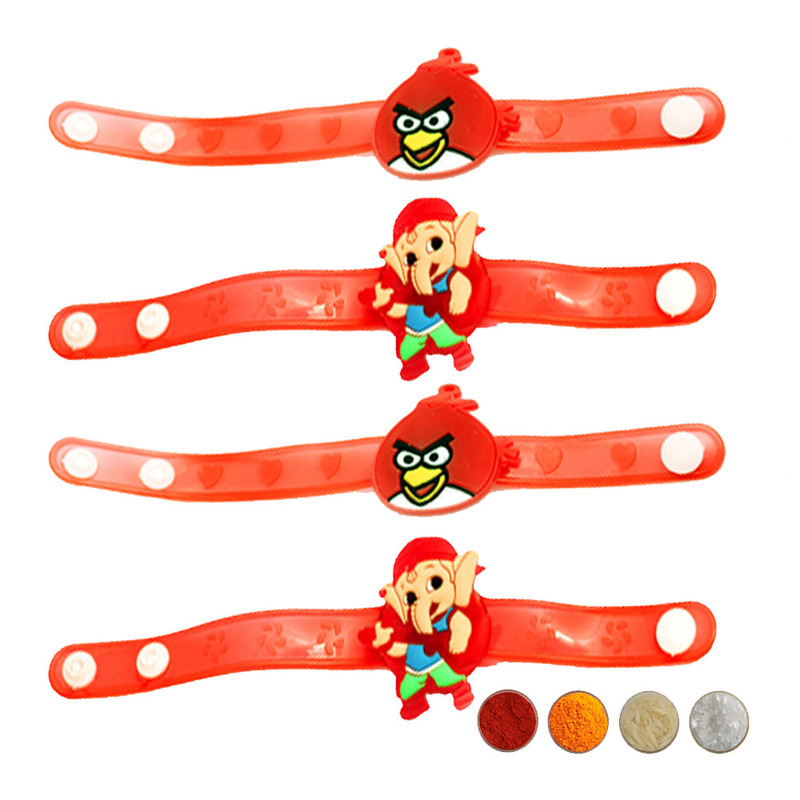 These rakhis are brightly colored and contain attractive designs to make them visually appealing for the kids. 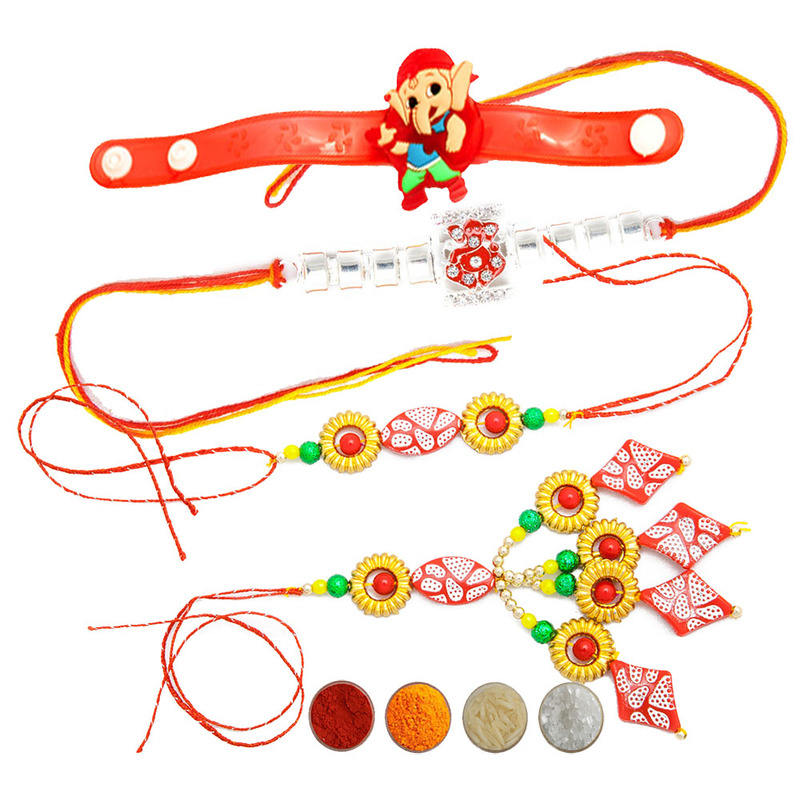 There are huge collection of rakhi gifts and gift hampers which you can send for your sister and bring a wide smile on her face. 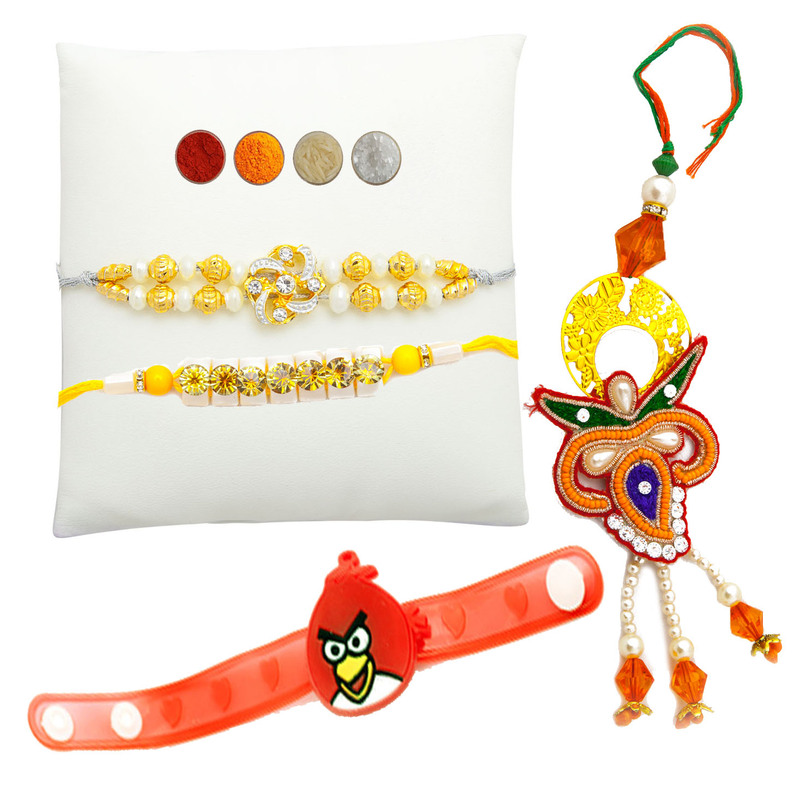 Sisters can team up there selected rakhi with unique rakhi gifts like personalized gifts, divine gifts, spiritual gifts, mugs and cushions and much more you can send online along with rakhi. 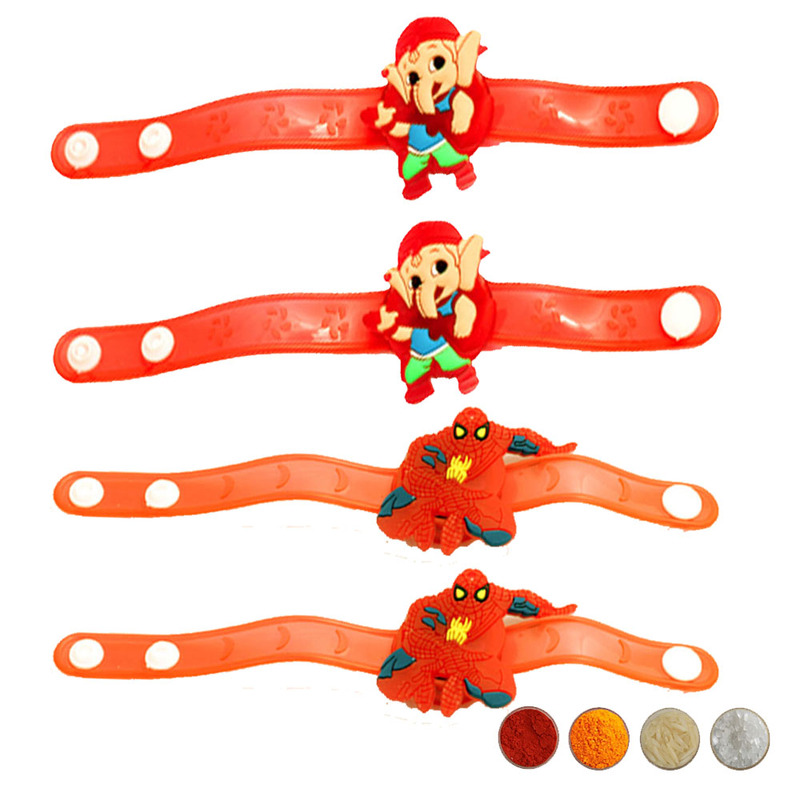 We have much varieties of rakhi in the rakhi set of 4 like auspicious rakhi, traditional rakhi, Lumba rakhi, kid’s rakhi, silver rakhi, golden rakhi, Zardosi rakhi, Mauli rakhi, bracelet rakhi, pearl rakhi etc. 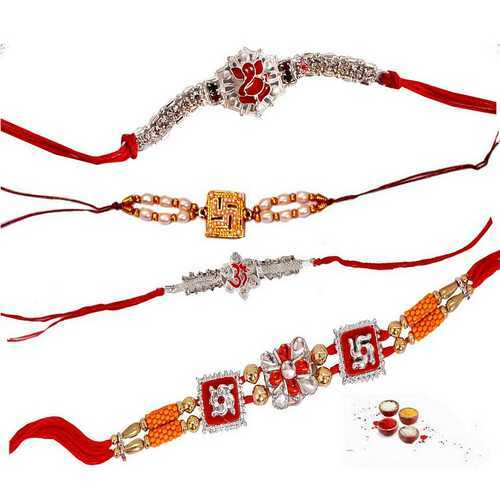 pick the best one for all your four brother and send rakhi set of 4 to India online without any hassle with the help of our express delivery services and we will make rakhi delivery in no time at your doorstep or at given address with the special facility of free delivery within India. 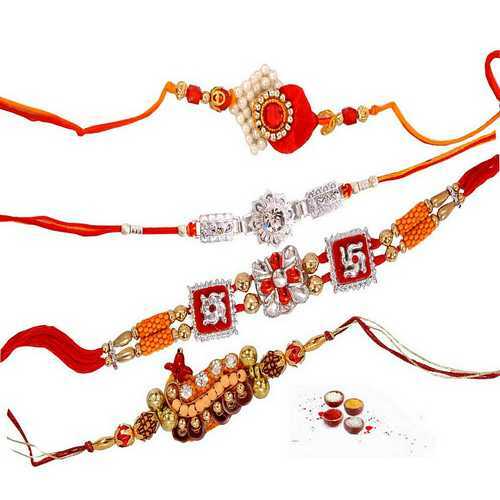 So make the festival extra special and memorable with exclusive Set of 4 Rakhi Online for Brother and send rakhi to India along with rakhi gifts across India like Mumbai, Pune, Kolkata, Dehradun, Bangalore, Amritsar, Ahmedabad, Bhopal, Indore, Kanpur, Jaipur, Jodhpur, Srinagar, Agra, Varanasi, Faridabad, Gurgaon, Ghaziabad, Delhi, Patna, Ranchi or anywhere in India.